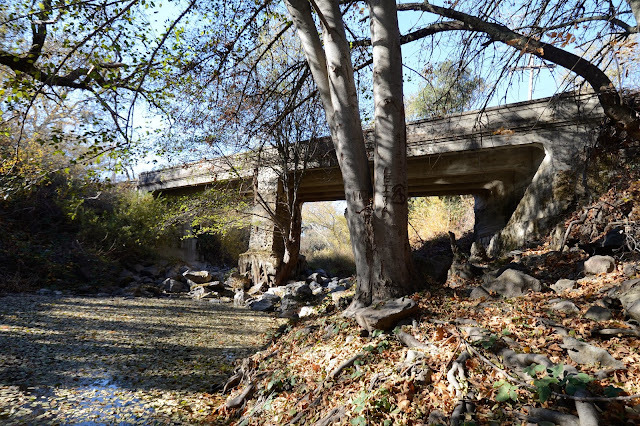 The next bridge across the Napa River is the Oakville Cross Road Bridge (21C0069), a two span 'T' girder bridge built in 1922. The bridge is composed of two 45 ft long spans and like yesterday's Oak Knoll Avenue Bridge it has only a 19 ft wide deck. Note that this reinforced concrete bridge is supported by a stone masonry pier. Perhaps the pier was from a previous bridge that was built at this site? Perhaps because of the narrow width, the unreinforced masonry wall, or the under-reinforced T girders, this bridge has a sufficiency rating of only 7.0. Oakville Cross Road, Oak Knoll Avenue, Trancas Street, etc. are the main east-west corridors across Napa Valley and so they carry quite a bit of traffic. Napa County, California Bridges: Oakville Cross Road over the Napa River by Mark Yashinsky is licensed under a Creative Commons Attribution-NonCommercial-NoDerivatives 4.0 International License.